The window fan is one of the most inexpensive, environmentally friendly cooling methods for your home, along with ceiling fans, tower fans, and pedestal fans. Although it’s not a substitute for window air conditioning on the hottest summer days, you can stay considerably more comfortable for much less money month to month by choosing the best window fan and learning how to use it properly. There are many benefits that come with having one or two, or several window fans in your home. But the primary benefit is that window fans can be used to pull in cool, fresh air from the outside or can be used to push out warm and stale air from the room, providing relief from hot weather at a very small fraction of the cost of an air conditioning system both in terms of initial and operating costs. Installing and operating a window fan in your home can be easy, but the first and foremost thing you need to do is choosing the right window fan that can effectively cool your home. In this article, we’ve listed and reviewed some of the best-rated household window fans available on the market that we think are worth your money. 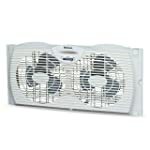 The Holmes HAWF-2041 Twin Window Fan is our pick as the best window fan for most people. This fan has great quality with a 3-year warranty at a very good price and it comes with most the needed features to keep you comfortable in hot summer days. The only missing thing is that this window fan doesn’t have a remote control. The Holmes Holmes HAWF-2041 twin window fan features dual blade operation with independent electronically reversible motors (3 speeds), allowing for air intake, exhaust or air exchange. The motor is waterproof so it is safe to use during rainy weather. The integrated comfort control thermostat helps to maintain your personal comfort level by cycling on and off to your desired setting. This window fan can cool a room up to 500 sq.ft. It is designed for use in most double hung and slider windows from 24in to 37in width with adjustable extender screen and extender panel. A window fan is a cooling appliance that is mounted on a window frame. They usually have expandable side panels that cover the window completely to facilitate the airflow from it. Window fans cool your home by pulling cool, outside air in or pushing hot air out, depending on which way the fans are facing. Window fans work best in windows that face the prevailing wind or are directly opposite. They are designed to fit into any type of window, double-hung, slider and casement windows. Most window fans have one, two or three blades with two or three speeds. The standard size is 20 inches window fan, although smaller window fans are also sold. One of the most popular options is the twin window fan. These can also work as reversible window fans. A reversible window fan let you adjust to changes in the wind direction without having to turn the fan around. By placing two window fans — one blowing in, one blowing out — in windows on opposite sides of a room, you can create cross-ventilation that moves air and makes you feel cooler. Most of today’s window fans are made of plastic. Many older window fans, however, are made of metal and are more solid. The more powerful window fans can be used to circulate air throughout a house, acting as a whole-house window fan – such as the Air King 9166F 20″ Whole House Window Fan. The more advanced window fans come with thermostats, LED indicators, and smart features such as timer and automation. But the ideal window fan for most people is the one that doesn’t vibrate and create noise during operation. Are Window Fans Good for Cooling Your Home? Window fans have an advantage over other room fans when it comes to cooling the home – they not only circulate the air within the room, but they can also replace the stale air inside the room by continually replacing it with fresh air from outside. On some window fans, such as the Holmes Dual Blade Twin Window Fan with Water-resistant Motors, they can achieve both at the same time. Many people don’t know the difference between air intake, exhaust or exchange, when they’re actually just what they sound like. When a window fan’s intake setting is in place, the fan pulls air from the outside into the house. When the switch is placed on the exhaust setting, the fan is pulling hot air from the room and pushing it outdoors. The air exchange occurs when one fan is exhausting hot air outdoors while the other is bringing cool air inside. Thus, window fans are the perfect choice for home air cooling and purifying. They are perfect for small rooms that tend to get stuffy, but they can also be mounted in windows of large rooms that require a greater amount of air circulation and ceiling fans aren’t enough. Window fans are budget-friendly and much more energy efficient than evaporative coolers or air conditioners, thus, making them a great choice for cooling your home. When working as an exhaust fan, not only drive the hot and stale air from inside to outside, window fans also eliminate any unwanted odors from your house. So, your home always smells fresh! Window fans are light and portable. So, you can shift them from one place to another at your with the convenience, as long as there is a window. Window fans are very easy to install in any kind of window frame, don’t require having holes on the wall like the ductless mini-split air conditioner. Window fans are generally quiet, making them ideal for bedrooms and night-time use. With a quiet window fan installed in the bedroom, you will feel cooler and therefore sleep better. Many window fans also include thermostats, remote controls, and temperature displays. These are great for providing optimal comfort as you have the ability to customize settings according to your schedule and room temperature preferences. 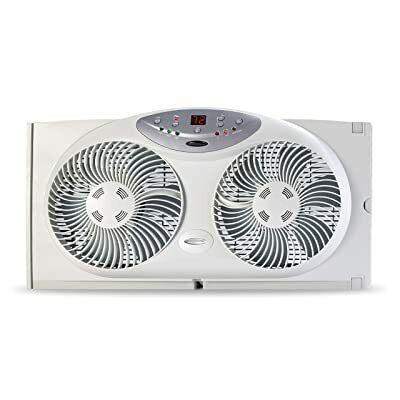 For example, the Bionaire Twin Reversible Airflow Window Fan with Remote Control includes Electronic control with LCD screen, remote control, and Programmable Thermostat. A window fan is mounted on a window frame. So you have to let the window open. Window fans require multiple units to cool an entire house. One of the things that makes heat less tolerable is humidity. If you live in a high humidity area and need a system that removes humidity from the air, a window fan may not be for you. A window fan is perfect for those who air using an AC. An AC just circulates the cool air within the room. It cannot bring in fresh air from outside. Using a window fan to complement the air conditioning unit ensures that there is a continuous supply of fresh air in your room. Thus, even while maintaining your AC at a high temperature, you can enjoy great cooling throughout the room. Another way is to use your air conditioner part of the time and use window fans the rest of the time. Using a window fan as an air conditioner alternative can significantly cut your energy costs. Not only one of the best-rated window fans available, the Bionaire Twin Reversible Airflow Window Fan is also one of the easiest to control twin window fans we’ve tested. 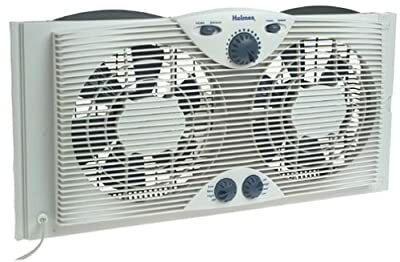 With a straightforward LCD screen and an individual button corresponding to the fan’s every feature, including speed, room temperature, and electronic reversibility—that means, like many good window fans, you can push a button (rather than physically flipping it) to change from drawing in fresh outdoor air to venting stale or smelly indoor air. You can also use a remote control to adjust the speed, airflow direction, and temperature from up to 15 feet (4.5 meters) away. Additionally, the Bionaire Twin Reversible Airflow Window Fan has a programmable thermostat. This is a smart feature that we really like as it allows you to set your desired temperature level to the degree from 60-80 degrees and the fan will automatically turn off and on in response to the ambient room temperature. 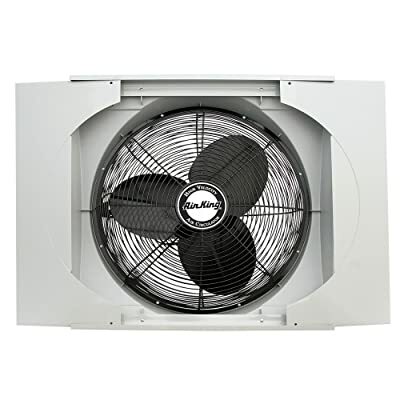 Not only one of the cheapest window exhaust fans you can buy, the Holmes HAWF2021 Twin Window Fan is also one of the best selling window fans on the market. This small window fan features 6-inch reversible airflow blades and is ideal for smaller rooms or for rooms that are using air conditioning. It is designed to fit a window from 22″ to 29″ inches. The Lasko Electric Reverse Window Fan W16900 is one of the most powerful window fans you can buy. This fan produces up to 2470 CFM at the highest speed, making it ideal for a large room like the living room or whole house. The Lasko W16900 is designed with slide panels on each side to custom fit a window that is 26.5-34.5 wide and no less than 22″ high. The ability to simply turn a knob to control the intake or exhaust flow of air provides you with the power to conveniently control your own comfort with three quiet speeds. This window fan comes equipped with a Storm Guard feature. This feature allows the window to close behind it; protecting your home and belongings. The Lasko Electric Reverse Window Fan W16900 is the best choice for those who don’t have air conditioning or who looking to save a lot on their energy bill in the summer. We’ve tried various window fans and we were really impressed with the power of this fan. 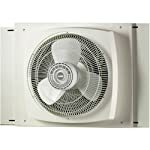 The Air King 9166F Whole House Window Fan includes a three-speed motor with air flow ranging from 2510 to 3560 CFM. 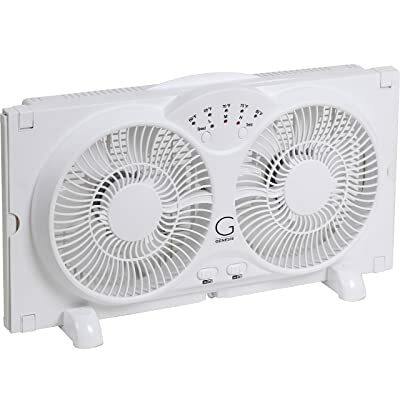 This powerful window fan can be used to circulate air in any room whether in a residential or work setting. 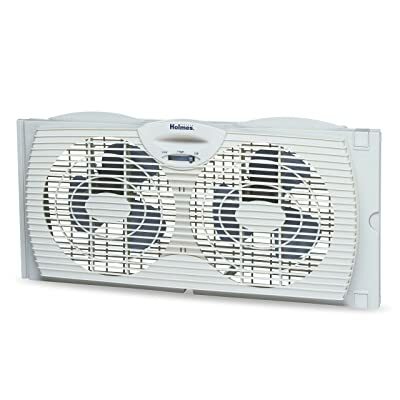 The 9166F Window Fan is built tough. It features impact resistant housing and a powder coated steel front grille and blades. The fan also features Air King’s Storm Guard System, which allows you to close the window behind the fan during inclement weather or when securing the home. 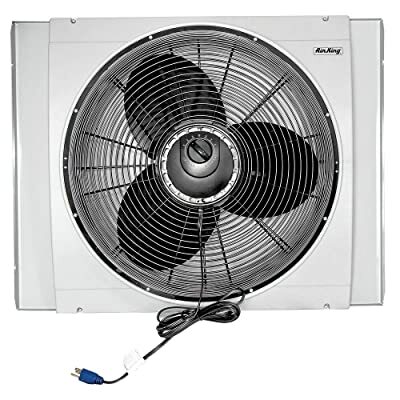 If leaving your cooling system on does not fit into your household budget, or if your home doesn’t include a central air system, the Air King 9166F provides a quick, easy, and money-saving solution. One of the best window fans for the bedroom you can buy is the Avalon Twin Window Fan. This fan is extremely quiet yet powerful. While Avalon doesn’t advertise the actual decibels this fan outputs, hundreds of positive reviews confirm this is on of the quietest window fans on the market. This window fan comes with three speed settings of low, medium, and high. It also has a digital inbuilt thermostat with a range from 60 to 80 degrees and the temperature can be tracked with a little help from the LED lights panel. The two fans also have their own individual durable copper motors, ensuring that they last through any kind of weather condition. The side panels of this window fan can be extended an additional 6.5 inches on either side, meaning that you can fit it in even a larger window.